Udaipur nestles like a gem around the clear blue of Lake Pichola in a valley surrounded by the Aravalli hills. The marble palaces, beautifully laid-out gardens, and clean lakes make Udaipur appear like a mirage in the desert. 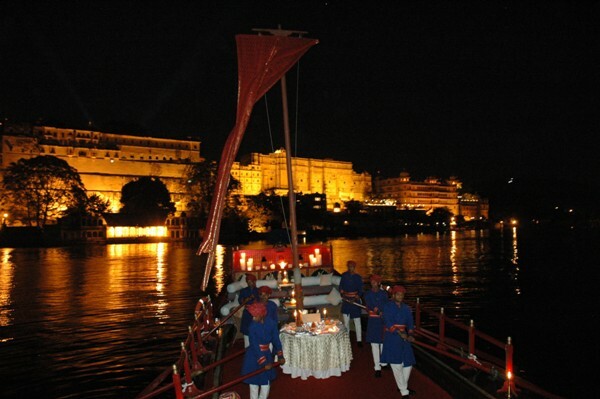 With lots of scenic beauty, the city of Udaipur is one of the spectacular cities of the country. It is well-known as the City of Lakes and considered to be one of the fascinating places in India & popular destination for honeymooners. This city is surrounded by the beautiful lakes including the Lake Pichola which is an eye catching one. In 1567 AD, Maharaja Udai Singh founded the city and this place is also renowned as the birthplace of the great Rajputana ruler, Maharana Pratap. Some of the places worth a visit are City Palace, Sheliyon Ki Badi, Maharana Pratap Memorial and Fatehsagar Lake. Many of the Hollywood and Bollywood directors captured the romantic fragrance of the city into their movies. City Palace complex:once the home of Mewar’s rulers and today a museum. The palace consists of several flawlessly integrated smaller palaces overlooking the placid beauty of Lake Pichola. Sahelion-ki-bari (Garden of the Maids of Honour)" in the north of Udaipur, once the scene for parties of the princess’s attendants. Drive around Fateh Sagar Lake, created in the late 17th century by Maharana Fateh Singh, and pass by the Puppet Museum (Lok Kala Mandal) and the statue of Maharana Pratap (Moti Magri). A Boat ride on Lake Pichola- A boat cruise along this 4 km long lake affords unforgettable views of the hills that surround Udaipur, as well as the palaces, temples and bathing ghats that make up this picturesque city. Visit the island palace of Jag Niwas, beautifully set in the lake.